Yesterday Phiras made a big pot of beef stock.. Everything just tastes completely different when stock is homemade, and even though it takes time to do it, it's well worth it.. So I was looking around the kitchen to see what we could have for dinner, using this beautiful stock, I decided on French Onion Soup, where the stock makes all the difference in taste.. And truly, we had the best soup for dinner.. Of course you can use store bought stock, it's still delicious and MUCH less time consuming..
Heat the olive oil and butter in a pot.. Add the onions, salt, pepper, sugar, thyme and bay leaf.. Sauté the onions until they are slightly caramelized and golden in color.. Deglaze with the cognac, add the stock, hot water, Worcester sauce and simmer on low-medium heat for about 30 minutes.. Remove the bay leaf before serving.. There are two ways of doing the following step, either in the oven or melting the cheese over a grill toaster.. If you have oven proof soup ware, place the breads on top of the soup, place gruyere generously on top then sprinkle with chives, place in the preheated oven for about 10 minutes or until the cheese is melted.. 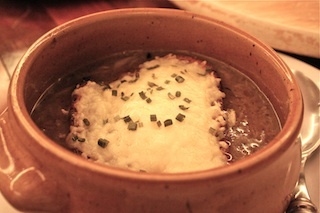 The easier version is to just place the melted cheese and chive breads on the soups right before serving.. Bon Appétit! Wow, what a nice post ! This soup looks yummy. Thanks for sharing nice recipe with us. I will try this at home. I like french cuisine food very much . Children also like such kind of yummy recipe. I have bookmarked this site and i will get back to you. I like visiting French restaurants in weekend.